With our production base in China, we specialize in supplying LED lamps, Numeric LED displays and Dot Matrix LED display in different colors and color combinations, luminous intensities, sizes and shapes. Our factories, in Guangdong Province, China, have been granted ISO 9002 and ISO 9001 certificates in 1998 and in 2002, respectively. For the sake of entering the automotive industry, we are on the way to QS-9000 certification. Employed in our factories are over 500 staff and workers, including 50 competent technicians. Our competitive edge lies on our strong OEM capability supported by ten Taiwan R&D engineers, who are stationed in our factories in China. For quality concerns, we source the die from first-rate suppliers in Taiwan, Japan and the U.S. And for the sake of quality consistency, we have imported fully automatic equipment including die-attaching machines, wire bonding machines, epoxy dipping lines and testing equipments. Sources of the equipment include ASM of Netherlands and makers in Taiwan. Currently, our factories produce over than 100 million pieces a month, representing a growth of about 10 percent over 2001. 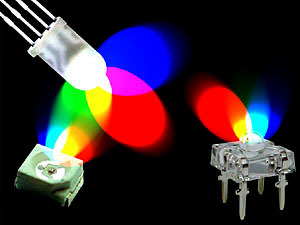 The growth is attributed mainly to ultra-bright LEDs. Significant improvement of LED lamps over the past few years is accounted the cause as well as the effect of their increasing uses. In the light of this trend, we have strategically shifted our emphasis to ultra-bright LED lamps though a complete series of LED and optoelectronic products can be found among our portfolio. Regarding LED displays, numeric/alphanumeric, dot matrix and LED light bars are offered. They are all tested according to the MIL-STD-105E II standard. 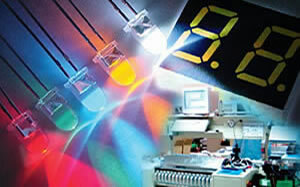 Furthermore, good prospects are expected for backlights as they are widely used in LCD displays. In addition to LED products of visible lights, we produce infrared diodes and infrared receiver modules for remote control functions. Our infrared diodes are available in different sizes, shapes and viewing angles, while infrared receiver modules are available in 2.4V, 3.0V, and 4.5V operating voltages. Amid keen competition among worldwide counterparts, we work for quality products at reasonable prices and on-time delivery. Lead-time for ordinary items is only two weeks while delivery of ultra bright and special items takes two to three weeks. Minimum ordering quantity is one thousand pieces. 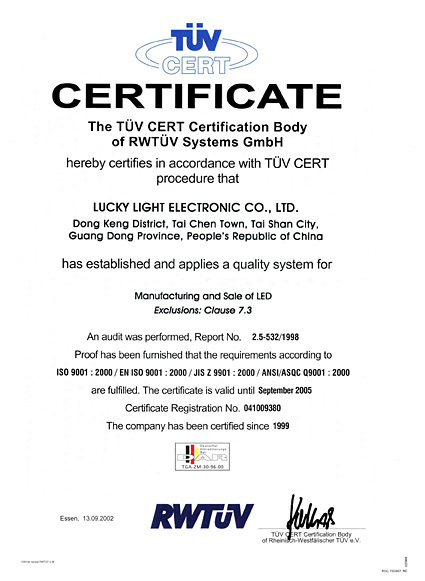 Our LED products are widely used in toys, electronic instruments, lifts, home appliances, telecom equipment, third brake lights, LED signboards, etc. Overseas orders represent 50 percent of the total business while the rest are absorbed mainly by Hong Kong and China. Our major outlets are Taiwan, South East Asia and Europe.